As a manufacturer of reagents, AESKU.DIAGNOSTICS has a great understanding of the automation needs faced by end-users when handling diagnostic products on a daily basis. While there are automation companies with great engineers, we still believe they sometimes lack a full understanding of the daily lab routine. Understanding these needs encouraged us to create state-of-the-art instruments. Therefore, AESKU.SYSTEMS is established to develop products that adapt to the laboratory reality. Our systems are designed to fullfil the highest usability requirements, making our instruments practical and easy to use. Since its launch, the HELMED® has never stopped evolving, revolutionizing the way lab routine is performed across 5 continents. Due to its innovative design, e.g. 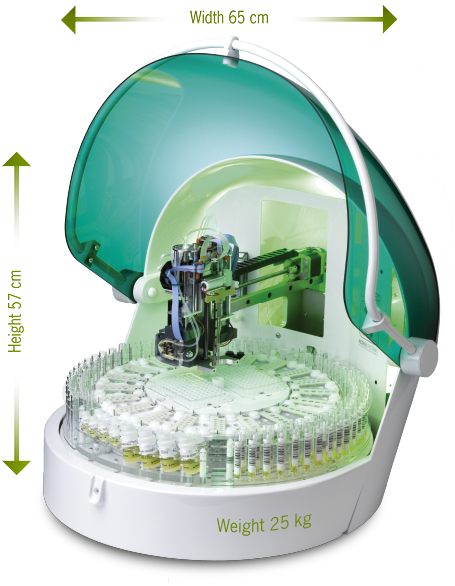 the 3-needle system and 3 independent rings, the HELMED® needs less processing time and increases the reproducibility of results compared to manual analysis or one-needle-systems. The HELMED® was the first machine to introduce a built-in barcode reader allowing automated detection and scanning of sample tube IDs, eliminating transcription errors. Communication between LIS and instrument can be done directly or via our middleware AESKU.LAB. The loading wizard provides clear visual instructions how to load the required reagents. All the steps after loading can be followed real time.